Are you ready for a delicious, fast recipe that will help your skin look young and vibrant? Peaches are in season–which means I’ve been enjoying one of my favorite fruit recipes a lot lately and can’t wait to share it with you! This recipe technically serves four but you could easily eat it all yourself in one sitting (don’t worry–it’s healthy). This delicious peach recipe would make a perfect side for a bridal shower or baby shower, as it is a simple dish that looks classy and pretty! It’s also a healthy crowd-pleaser to bring to a potluck or picnic. Basil is known for its exceptional anti-bacterial and anti-aging properties. Its also known for its stress and anxiety reducing properties! The Vitamin E in almonds helps protect your skin from the sun’s damaging UV rays. One of the major antioxidants in peaches, chlorogenic acid, helps destroy free radicals to reduce the effects of aging! The Vitamin C in peaches is great for your skin. Some people even put sliced peaches under their eyes to reduce the appearance of under eye circles! This makes peaches a delicious beauty food for sure! 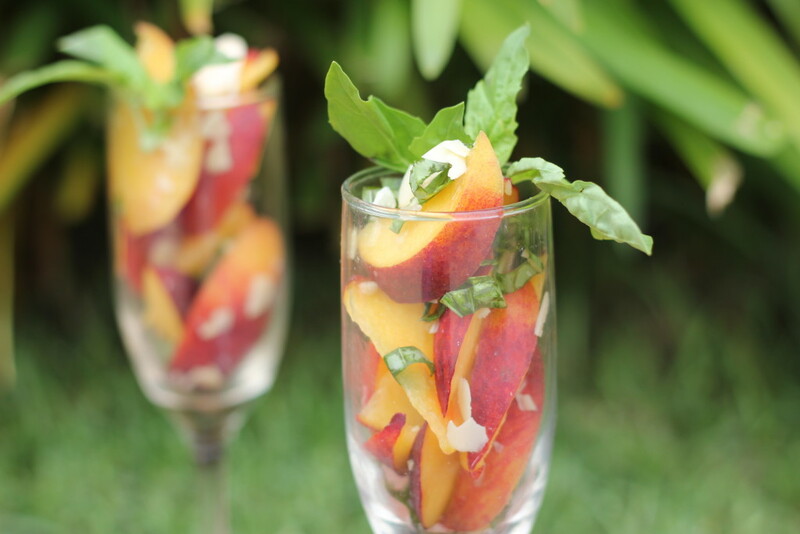 This delicious peach recipe would make a perfect side for a bridal shower or baby shower, as it is a simple dish that looks classy and pretty! Slice the peaches in half and remove the pits. Slice each peach into strips (approximately half a centimeter wide at the widest part). Cut off and discard any bruised spots. Toss the peaches in a bowl with the lemon juice and almonds. Chop the mint and basil into very fine strips and mix in with the peach mixture. Serve immediately or chill to marinade! I like to spoon into a glass for presentation and top with extra herbs and almonds. Enjoy!